I’m starting a little something new today. A whole new blog schedule. As my regular subscribers probably know, I’ve posted daily for eons. Well, if 7 years counts as eons, at least. But that streak has finally been broken…and I’ve wanted to change things up, so now’s as good a time as any, right? On Mondays, or at least most Mondays, I’ll post what I’m calling Magical Mondays. I get so many requests for videos on cards that I post both here and Instagram – “Just turn on the camera so we can watch.” So that’s what this is – all art, no chatter. The voiceovers tend to be the hardest part, so one day a week of skipping that will be my easy day. The first Magical Monday was shot at the retreat I was at over a week ago, along with a few upcoming videos. If you can’t see the video below, click HERE to watch directly on YouTube. I’m hooked. What a gorgeous (hee hee) start to Magical Mondays! I enjoyed seeing the start to finish in a few minutes, listening to the beautiful background music, and knowing there will be more to come. I appreciate hearing you at other times; this is just for being totally entranced! Oh, yes the blue nail polish was “too cool”! Loving this new Magical Monday! Great idea!! Can’t wait to see your other special features to come. 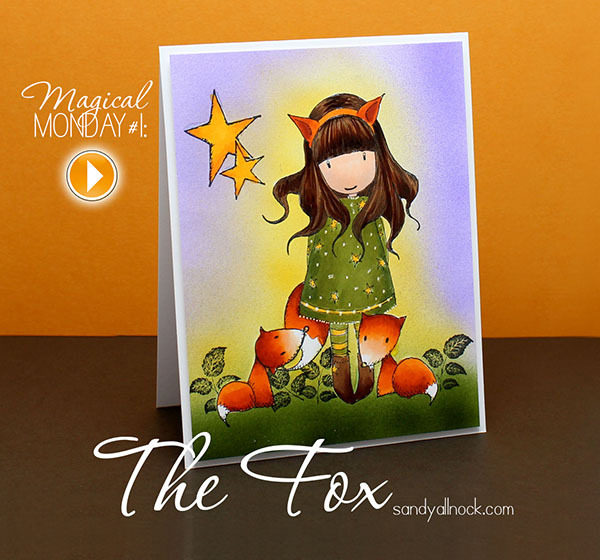 I am going to love Magical Mondays! I love to watch you color. Well, I kinda miss the chatter! I am still new enough at copics that I love hearing the tips and explanations. But I did especially love watching you do the background. If I am not careful, I am going to be needing an airbrush. Love the video and the gorgeous coloring!! Thanks for the inspiration. Just when I think I am out, along comes Sandy Allnock and pulls me back in! No house work getting done today obviously. 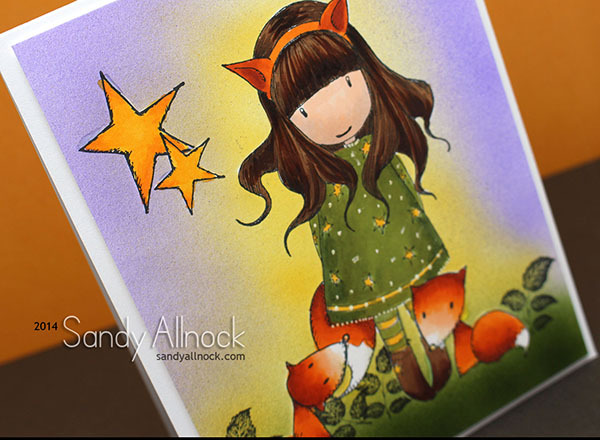 Who wouldn’t just love those darling little foxes? I just love watching you colour, but I miss hearing your voice and your great tips. The card is so vibrant, and that blue nail polish isn’t bad either. Coloring can be therapeutic, but watching a master color is entrancing and inspiring. It would take an awful, awful lot for me to ever get tired of seeing you color. When the local scrapbook store got Gorjuss Girls in, I thought “now that’s something I’ll never spend money on”. Then I took the On-Line Card Class, and now I need this stamp! I used to hate colouring. But I had all these copics just sitting on my shelf. Now that I know how to use them properly, I love colouring! I’m looking at stamps differently. Sadly the LSS has sold out of all Gorjuss stamps and won’t re-order them. Yay! I love it! I love just watching! Thanks so much for sharing this! Oh Sandy! First one and I’m already in love. You don’t have to talk to us – this was indeed magical. I’ll be here every Monday (actually I never miss a post but I’m looking forward to more of these). This reminds me of watching you color at Absolutely Everything. You are an amazing colorer… 🙂 I think I will enjoy this feature immensely. I know I’ve said it before, but I could watch you color all day. It’s so delightful watching an image come to life as you color it. The music you chose for this one was perfect. Love it, Sandy! Beautiful coloring – so bright and happy! Darling card! I just love watching you color. So fascinating. It really helps me get better with my shading and color combinations. Thank you so much. Keep them coming!